In 2007, food prices increased dramatically and the world quickly ushered in a global food crisis that lasted until late 2009. The global price increase mainly affected basic food commodities such as wheat, rice and corn, but not so much products such as coffee and cacao. The effects were felt fast and hard, especially in developing countries where much of the food was being imported and where people, who already spent half or more of their income on groceries, couldn't afford a doubling of food prices. Riots started to take place in many cities around the world by people who no longer could afford to buy enough food to themselves and their families. In the developing countries worst affected, the national governments tried to counter the food price crisis with various political and economic means. They reduced taxes on cereals and lowered the tariff on imports of food and/or introduced various food subsidizes for their citizens. Many developing countries, including China and India, also introduced export restrictions on their own agricultural and food products - sparking heavy criticism from the US and IMF. Looking back at the events it's easy to see that it was just a bubble and that food prices, almost as quickly as they had come, went back to their previous levels again. But back then, in the middle of it, many people claimed that the crisis was a sign of things to come, and that overpopulation was the main culprit. In a discussion on Nightwaves on BBC Radio 3, Susan Blackmore, a neuroscientist, and Professor John Gray, from the London School of Economics, discussed overpopulation and its link to the then ongoing food crisis. Both agreed that the "fundamental problem" is that there are just "too many people", with Blackmore adding that she hoped, "for the planet's sake", that a global disease, such as the bird flu, would come and "reduce the population". In a TV interview, Britain's Prince Phillip said that it was the demand for food from "too many people" that had caused the food price crisis. 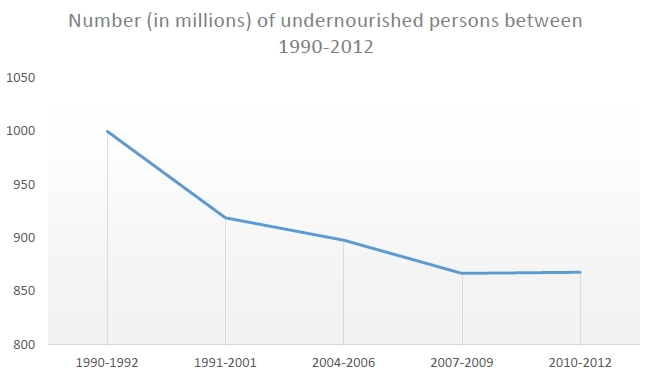 Number (in millions) of undernourished people between 1990 and 2012. Source: FAO Hunger Portal 2012. According to recent figures, around 870 million people were undernourished during 2010-2012. Those numbers equal 12.5 percent of the global population. The majority of these people live in developing countries in sub-Saharan Africa, Western Asia and Northern Africa. As can be see in the figure above, this number is a reduction since early 1990's levels when around 19 percent of the global population was undernourished. So progress in food security has been made. But from the numbers one can also see that most of this progress was accomplished before the global food price crisis in 2007-2008. Since then, the reduction in undernourished people has slowed down and leveled off. Despite this, the actual increase in global hunger was less severe than previously expected. The FAO, WFP and IFAD concludes in their 2012 report on food insecurity that "it is clear" that the previous achievements in reducing hunger has "slowed considerably since 2007", and that it's doubtful that the Millennium Development Goals, as well as previously stated hunger targets and commitments in several regions around the world will be achieved in the near future. These failures in reducing undernourishment can be blamed on political instability due to wars and conflicts. But a lack of political will to prioritize hunger reductions, weak government structures and institutions such as the absence of proper transparency and food programs, both on a regional and global level, can also be blamed for the failure. The food price crisis, nor the halt in the reduction of global hunger, had nothing to do with overpopulation and inadequate food production - such as the scenario populationists are constantly warning about. In fact, both 2007-2008 were pretty normal years for farmers. Their yields varied no more than usual and the total world food production continued to grow by 1-2 percent per year - the same pace as it had done for the past decade. It's true that farmers had troublesome years during 2006-2007 in Australia due to drought, and that the EU and Ukraine produced much less wheat than estimated before 2007. But this reduction was offset by unusually good harvests in Russia, USA, Argentina and Kazakhstan. In fact, the total amount of wheat on the global market increased by around 5 percent which resulted in record yields in 2006-2007. Demands from large populous nations such as China and India had no effect on the rising food prices either as the two nations are both net exporters of cereals. Instead, rising oil prices and growing productions of biofuels were to blame for the food price crisis. Fossil energy in the form of oil is an important component in the modern agriculture industry, so it's not surprising that changes in oil price will have effects on the price of food for consumers worldwide. In this case it was the increasing costs involved in the highly energy intense production of nitrogen fertilizers for agriculture that in turn resulted in increased food prices. The second reason was the growing production of biofuels from agricultural commodities. To put things into perspective and to show just on what massive scale global biofuel production is on let's take the US as an example: About 25 percent of the US corn production is now used in producing ethanol - which is far more than the country's entire total corn export. Globally, biofuel production, which is based on agricultural commodities, has more than tripled 2000-2008. Today it accounts for more than two percent of the global consumption of transport fuels. Another example: In 2007-2008, roughly 10 percent of the total usage of coarse grains was used in the production of ethanol. Jean Ziegler, UN's independent expert on the right to food, has called the production of biofuels from food crops a "catastrophe for the hungry people" and a "crime against humanity". In light of the food price crisis the FAO convened a three-day meeting with experts in Rome, Italy, in June of 2009. They came to the conclusion that the food price crisis was a result of increases in energy prices, and that it shows how energy and agricultural markets are becoming more intertwined with each other. In their report they warn that a further rise in biofuels production would be "a real risk" for global food security. They therefore urge that policies that promote the use of agricultural commodities for biofuels production "should be reconsidered" so that the competition between food and fuels can be mitigated. These malnutrition numbers represents people who don't get their minimum energy intake, which FAO considers to be about 1900 calories per day/person, the exact amount of calories varies depending on region, age and gender. The human body needs a diet of enough variation between vitamins, fat, proteins and minerals. 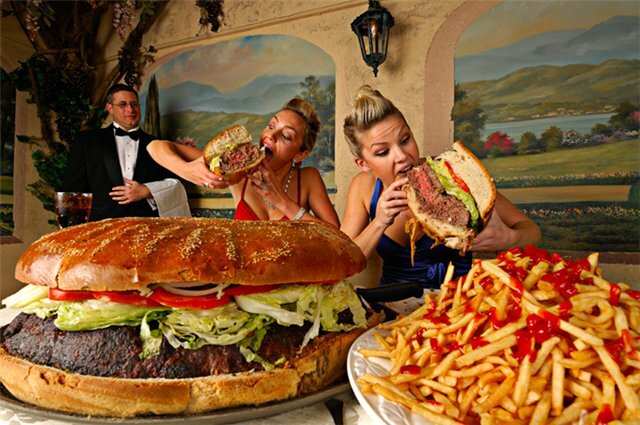 So just because one gets enough of calories doesn't mean one has a balanced and satisfactory diet. It's estimated that at least one billion people suffers from this "hidden hunger" which is characterized by various forms of nutrient shortages, which turns into deficiency diseases and often develops into chronic sickness. Here's the twist. We are currently experiencing a nutrition transition, characterized by overnutrition and obesity, which affects all societies around the world. As urbanization increases and people's incomes grow bigger, more people are gradually adopting a lifestyle which involves not just reduced physical activity but also a more energy-dense diet, which consists of semi-processed foods which are higher in saturated fats, sugars and cholesterol. Obesity has more than doubled since the 1980's and the majority of adult obesity can be found in developed countries, with the US being a prime example. As a result of this transition, the number of overweight people has reached more than 1.4 billion people worldwide. This surpasses the number of undernourished people in the world.